Portrait of Marion Greenwood c. 1929. Lithograph. 9 1/2 x 7 5/8. Illustrated: Clinton Adams, American Lithographers, 1900-1960, page 61. $750.Signed in pencil. John Carroll was a painter famous for his portraits of dreamy, diaphanous women. He also painted landscapes but his portraits became his signature pieces. 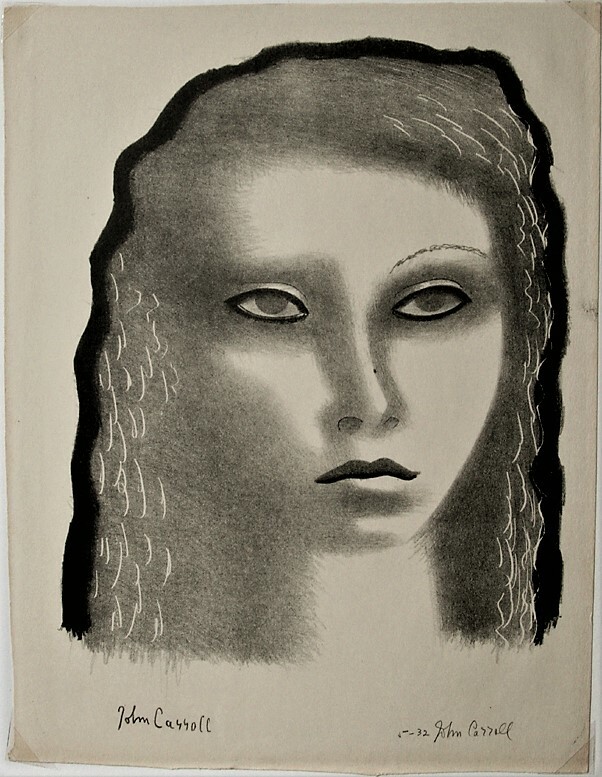 Born in Brooklyn in 1909, Marion Greenwood first visited Woodstock in 1920 with her father, who was also a painter. In 1924, when only fourteen years old, she left school to study with George Bridgman, Frank Vincent DuMond, and John Sloan at the Art Students League in New York. Greenwood also exhibited in the Woodstock Artists Association for the first time in that year. 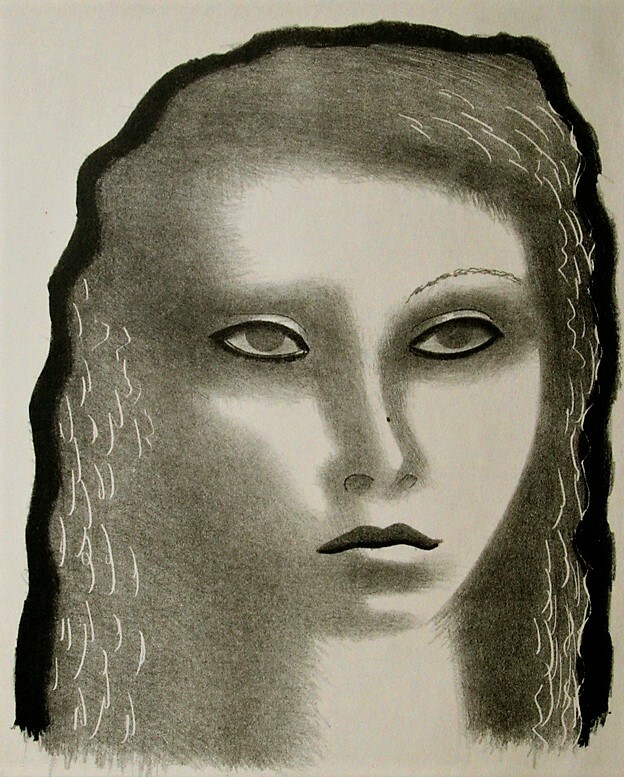 After four years at the League, she went to study at Colarossi's in Paris and later, in Woodstock, she studied lithography with Emil Ganso and mosaic technique with Alexander Archipenko. In 1932 Greenwood vacationed in Taxco, Mexico, and while there she executed a small fresco in the Hotel Taxqueno depicting native life. This work brought her to the attention of the Mexican muralists Diego Rivera and Jose Clemente Orozco and led to a commission from the Mexican government to execute a mural at the University San Nicolas Hidalgo in Morelia on the subject of Trascan Indian life. At the age of twenty-three she had become the first American woman to receive a mural commission from a foreign government. During the next six years she completed other murals in Mexico City; Camden, New Jersey; Crossville, Tennessee; and Brooklyn, New York. With her sister Grace, and under the direction of the American expatriate artist Pablo O'Higgins, she painted her finest mural at the Adlejarbo Rodriguez market in Mexico City. She exhibited at the 1939 World's Fair and after 1940 concentrated primarily on easel painting. In 1944 she had her first solo exhibition at Associated American Artists in New York. Stimulated by the exotic and the ethnic, Greenwood sought inspiration for her work in travels to the West Indies, North Africa, India, Hong Kong, China and Europe. Greenwood's figurative work as a muralist and easel painter represents people as individuals, not as generalized types. Her greatest strength as a portraitist lies in her ability to convey the humanity of her subjects. An active member of the Woodstock artist community, she is remembered for her vivacious personality, her wit and her commitment to the craft. From Woodstock's Art Heritage, with a historical survey by Tom Wolf, Woodstock, New York, 1987. She died in Woodstock, New York, in 1970.